Approximately 3 weeks after services install, a postcard will arrive at your service address. 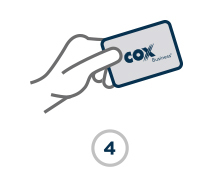 Register to receive your Cox Business Reward Card. 6-8 weeks after your online registration, you will receive your FREE prepaid card. What do I need to do to receive my prepaid card? Once you purchase and install the qualifying products, you will receive mail notification via postcard with detailed instructions on how to register online to receive your prepaid card. You will be instructed to visit the Cox Business reward card redemption site – and complete the online redemption form using the information included in the postcard. Your account must remain active, be in good standing, and retain all services for a minimum of 30 days after install. Which Cox Markets are part of the prepaid card campaign? 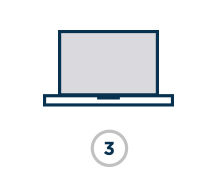 Customers who install the eligible Cox products within 2 months after ordering eligible products in the following markets: Georgia, Florida, Louisiana, Oklahoma, Kansas, Arkansas, Omaha, Iowa, Idaho, Nebraska and Arizona. When should I expect to receive my prepaid card? Card will be delivered within approximately 6-8 weeks of Cox receiving the completed redemption information online. It has been over 30 days since I purchased services, and I have not received my postcard to register online and receive my prepaid card. What should I do? The postcard will arrive at your service address within three to four weeks after you have completed installation of your services. If it has been more than four weeks after you completed installation of services and you have not received your postcard, please contact our customer service department at 1-833-843-6429, Monday through Friday from 7:00 A.M. to 7:00 P.M. CST. What is an installation of services date? 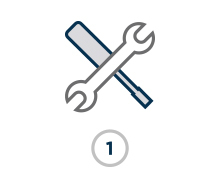 The installation of services date is the date in which the equipment and services you purchased with Cox were installed at your service address. What type of prepaid card will I receive? A prepaid Visa ® Card. It carries a fixed value that you can use anywhere debit cards are accepted. You can use your card to shop from catalogs, retail stores and even place orders online. How does my prepaid card work? KEYPAD – When there is a keypad, swipe your prepaid card and select CREDIT, then sign the receipt. Your purchase total will be deducted from your card balance. NO KEYPAD – When there is no keypad, just present your prepaid card salesperson and sign the purchase receipt. Your purchase total will be deducted from your card balance. Can I use my prepaid Card at an ATM? Prepaid Cards cannot be used for withdrawing cash at an ATM or any other financial institution. Whose name will appear on the card? During the online registration process to receive your prepaid card you will have the option to choose the name of the person you would like your card issued to. I am having problems claiming my prepaid card. What should I do? Please contact our customer service department at 1-833-843-6429, Monday through Friday from 7:00 A.M. to 7:00 P.M. CST. Can I use my prepaid card as payment for my Cox bill? You can use your prepaid card to pay for your Bill online or by phone. Is there a policy to replace stolen, destroyed or lost cards? In the case that a prepaid card is lost, stolen or damaged, or if it becomes non-negotiable, invalid or forfeited; Cox will not be able to issue a new or replacement card. How can I check the balance on my prepaid card? For assistance activating, using or checking the balance of the prepaid card visit: www.myprepaid.info or call the prepaid card customer service at 1-833-843-6429, Monday through Friday from 7:00 A.M. to 7:00 P.M. CST. How can I get assistance regarding issues while using my prepaid card? Please call the prepaid card customer service at 1-833-843-6429, Monday through Friday from 7:00 A.M. to 7:00 P.M. CST. You will be able to request support with issues using your prepaid card and/or dispute any transaction. How can I obtain additional information regarding my prepaid card? Any additional questions regarding the prepaid card could be obtained by dialing 1-833-843-6429; Monday – Friday; 7:00 A.M. - 7:00 P.M. (CST). 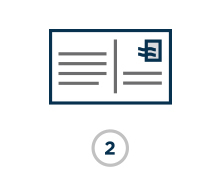 How can I obtain information about the “Refer a Business” Reward Program?